With the growing use of megapixel cameras and associated low light concerns, the use of IR illumination has gained more attention. 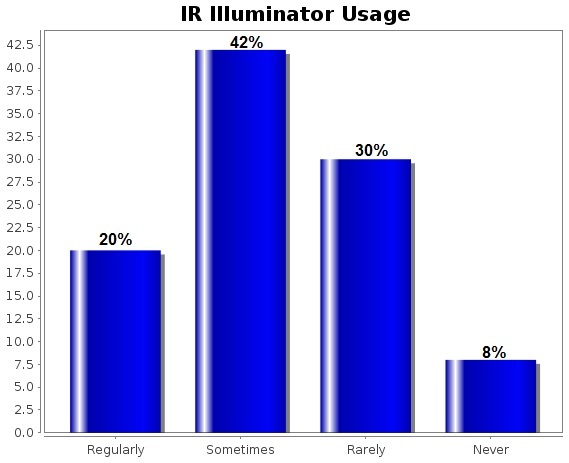 However, how many integrators are really using IR illuminators, and when. In this review, we examine our Integrator Survey results answering the questions: (1) How often do integrators use IR lighting for outdoor cameras? and (2) How often do integrators use cameras with integrated IR? In response to the first question, nearly 62% of respondents answered that they regularly or sometimes deploy IR illuminators with outdoor cameras. The remainder rarely or never used IR illumination. One might expect that the shift from SD resolution to HD or megapixel has driven some of this adoption of IR illumination, due to megapixel sensors' lower sensitivity. However, respondents who predominantly deployed SD cameras were just as likely (less than one percent variance) to use IR illuminators as those installing more megapixel cameras. Variables such as system size, geographic location, and preferred IP camera manufacturer also had little effect on these percentages. Perhaps the more interesting question is how many integrators deploying IR illuminators are using cameras with built-in IR lighting as opposed to a separate, external illuminator. Of those answering that they regularly or sometimes deploy IR with outdoor cameras, nearly 65% sometimes or often used cameras with built-in IR. "It's economically advantageous to use cameras with integrated IR's. In special circumstances, we will deploy separate emitters." "Cheaper and easier to install than separate IR lighting. Also, if I am going to install a separate light I will leave that to the owner and have them install regular lighting, it's dual purpose, works better, and cheaper." "Easier to install and service. Less equipment for the customer to purchase." "It's a easy solution on lower demand solutions." "We like the convenience of having the LED's built into the cameras." "If you have an independent IR source you have more choices of IR light intensities to get the proper exposure. Personally, I try to encourage the use of white lights such as motion sensor lighting (when practical) to get color info. Many times a cheap security light or ambient light from a street lamp or parking lot light will give better results than IR light, especially at a distance." "Only when a low price camera has to be used due to clients monetary restraints. Usually an outdoor dome with IR. Performance is average. I always recommend improving background lighting first." "We feel those integrated solutions are not a very professional offering and are weak in their coverage." "Coverage and range of IR. Plus bugs and spiders." "A standalone IR unit produces much more 'light' thatn an integrated unit"
It is true that a main concern with built-in IR is performance. Manufacturers routinely overstate IR throw distance in their specifications, as we have discussed before in our IR illuminator performance tests. Built-in illuminators are also rarely adjustable in their angle of illumination and power output. This could lead to the illumination not matching the camera's field of view, or overexposing the image. As one respondent noted, insects and spiders can be an issue when using IR-equipped cameras. We discussed this in a recent LinkedIn discussion, along with possible solutions. "If IR is short range or does not need to flood the whole area. Two of the VivoTek cameras we use have it built in so we just use it since it's already onboard." "We used such cameras (Avigilon dome with IR) only in some installations where we have to install cameras in the rooms and cover 3-5 meters with IR lightning." "The ACTi TCM-1231 has built in IR. We installed a motion light for night usage for better results." "The Sony SNCCH160 is a great 720P IP camera with built-in IR. We use it all the time." "[Built-in IR] can be advantageous in outdoor areas, Sony makes good versions of these." "We have found that the Sony DH160 and DH180 cameras are superior in image quality and with the added IR lighting built in, they are great for exterior applications." It's worth noting that Sony's IR-equipped cameras also feature "smart" IR, which reduces power to the LEDs as subjects in the FOV near the camera. This is intended to reduce overexposure, and may be one reason for more positive reviews of their built-in IR. Built-in IR is far more popular in the United States than it is in the rest of the world. 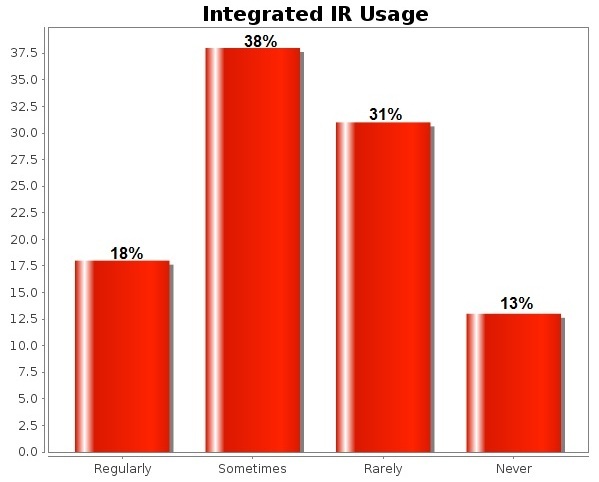 The most significant difference: 23% of US respondents stated that they regularly choose built-in IR vs. only 6% of international respondents.